Today, it's mostly opening ceremonies. Wednesday's theme is "Children's Day" with a bunch of activities in City Hall Plaza. I wouldn't make a special trip on Thursday for the concerts; but party band The Flounders play at Noon, and "funky folksters" Mad Sweet Pangs boogie down at 4pm. If you're not going to start your weekend on Thursday night, you might wake up early enough to hear the Declaration of Independence read from the Old State House balcony at 10am on Friday. That could give you the chills to recreate the experience of 1776. 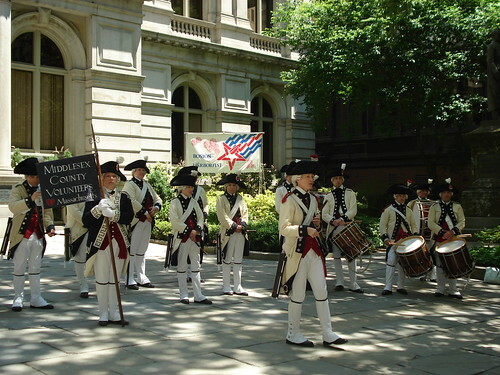 At 11am, someone traditionally gives a speech on Liberty upstairs at Faneuil Hall. As I said in an earlier post, this might not be the best year to cram yourself by the Charles for the concert and fireworks, but do what you want to do. The capper on Sunday is always Chowderfest (11am to 6pm). Waiting in a long line for all-you-eat chowder under the hot sun may not sound great, but I've done it a couple times. This is one of those events where you should try going at the beginning for the shortest line. Previous winners Christopher's of Maynard & Turner's Fisheries will be there as well as The Chicken Bone, The Daily Catch, The Daily Grill, Farmer Brown's, Oceanaire, Parker's Restaurant, Quarterdeck, and sailors from the USS Bataan. There are free public tours of the USS Bataan through SUN 7/6 from 10am to 4pm (first-come, first-served). It's docked at the North Jetty of the Marine Industrial Park (PDF map). If you don't want to walk from South Station, you could the the #3, #6, #7 or "Silver Line". See the next post below for other cheap Tuesday stuff.